January always makes me think of home – the weather is cold, we stay at home a little more, my thoughts are focused on our home life, organization and food. It's a hunker-down month. Just adore your library nerdy-ness! Empty Family arrive today! What a great idea! I might steal it next year. Is February love? Lovely! 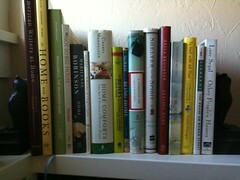 I’m so lazy that I’ve had the same vintage books on the mantle for over a year!